The 2015 Southeast Africa floods, partially related to Cyclone Bansi and Tropical Storm Chedza, killed at least 176 people in Malawi, 86 in Mozambique, and at least 46 in Madagascar over the course of a week while leaving hundreds more missing. Vice President of Malawi Saulos Chilima stated that over 200,000 Malawian people have been displaced by the flood. About 400,000 African people have been displaced in total, and 153 were declared missing. Flooding began on January 14, 2015, subsiding at the end of the month. Due to the flooding, the soil in some areas became over saturated and caused landslides, leading to more deaths. The rainfall of Southeast Africa was recorded as being 150% higher than normal, flooding roughly 63,000 hectares in total. Through years of research, Africa is said to have shown a complex pattern of rainfall, causing droughts and floods in the same season. Much of the damage from the 2014-2015 rain season can be attributed to the effects of El Niño. Two weeks of heavy rainfall killed 176 people and caused US$450 million in damage, or roughly 10% of the country's GDP. ^ a b Reuters (23 January 2015). ""Dire" needs of southern African flood survivors unmet two weeks on - TRFN". Reuters Foundation. Retrieved 23 January 2015. ^ Associated Press (16 Jan 2015). "Floods kill scores in Malawi, Mozambique". USAToday. Retrieved 25 Jan 2015. ^ Associated Press (17 January 2015). "Malawi floods kill 176 people". The Guardian. Retrieved 17 January 2015. ^ "BBC News - Malawi floods kill 170 and leave thousands homeless". BBC News. ^ "Flood death toll across Southern Africa reaches 260". Chicago Tribune. Retrieved 21 January 2015. ^ "Madagascar tropical storm claims 46 lives". Yahoo News! via AP. Retrieved 21 January 2015. ^ Chonghaile, Clár Ní. "Malawi floods devastation far worse than first thought". the Guardian. Retrieved 2015-11-23. ^ "Madagascar : Saison cyclonique 2014-2015 : Inondation et tempête tropicale Chedza - Rapport de mise à jour n. 13, Jeudi, le 29 janvier 2015". ReliefWeb (in French). Retrieved 2015-11-23. 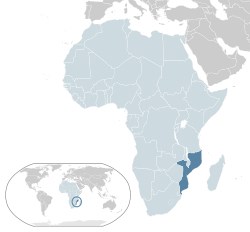 ^ "Madagascar storm death toll climbs to 68". ReliefWeb. Retrieved 2015-11-23. ^ "South East Africa - Floods Hit Zimbabwe, Malawi and Mozambique - FloodList". FloodList. Retrieved 2015-11-23. ^ Chikoko, Rex. "Flood-hit Malawi faces aid deficit". Mail and Guardian. IAB. Retrieved 23 November 2015. ^ Janowiak, John (27 February 1987). "An Investigation of Interannual Rainfall Variability in Africa". Journal of Climate. NMC/MWS/NOAA. 1: 240–243. doi:10.1175/1520-0442(1988)001<0240:aioirv>2.0.co;2. Retrieved 23 November 2015. ^ Winsor, Morgan. "El Niño In Africa 2015: Weather Phenomenon May Devastate East African Farmers, Herders With Drought, Floods". International Business Times. IBT Media Inc. Retrieved 23 November 2015. ^ Jeff Masters (January 19, 2016). "Earth's 29 Billion-Dollar Weather Disasters of 2015: 4th Most on Record". Weather Underground. Retrieved January 19, 2016. This article about a flood is a stub. You can help Wikipedia by expanding it. This page was last edited on 12 October 2018, at 01:39 (UTC).